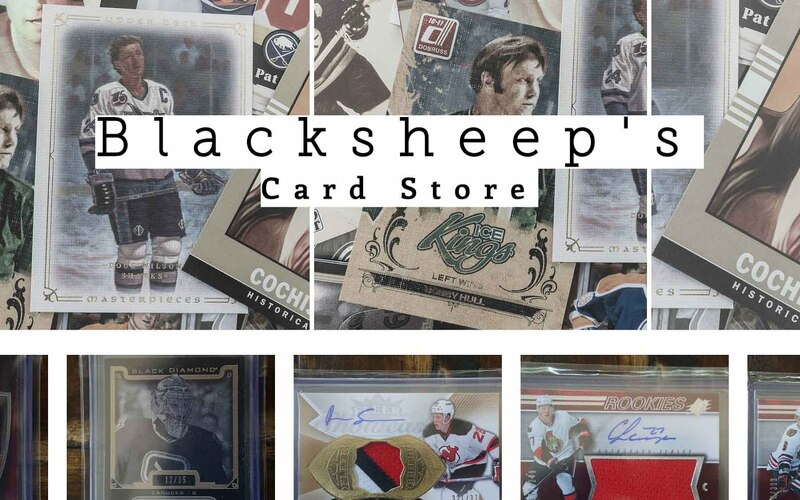 Upper Deck has released a brand new brand for hockey collectors to sink their teeth into as the NHL playoffs get underway. Contours is a product that offers collectors a one-hit-per-pack opening experience. I'd place this product squarely into the mid-range territory in terms of hockey products. Many collectors will be able to afford a box or two, but will they want to? The Contours base design has a curved die-cut towards the top of the card near the Contours logo. Obviously, this die-cut is what makes Contours... well... Contours. The word 'contour' evokes an image of curves. And there are quite a few curvy lines on the base card - as well as in the sport of hockey - like around the puck, the bend of the stick, the actual rink... many, many, things... but why name a set after that word? I really just don't know. I guess I'm just finding it hard to find a good reason for this name. It just seems like it came out of nowhere! Forgive me, but I can't get past the name of this set! The back of the base card mirrors the front in many ways. There is the use of the same image as well as the team colors subtly applied around the photo. The contours that surround the player are still there, but rather than adding more to the scene as on the front, these close off the card with an icy background. The design doesn't allow for much by way of stats (just one year and a total), but there is room enough to include a nice write-up of the player, which is always appreciated. Rookie cards come at the end of the main set. Two types of rookie cards rookie cards can be found. The first is the one that I got. It mirrors the look of the regular set except for a few differences. These rookie cards feature a sticker autograph, numbering to 499, and deep die-cut edges along with a 'rookies' logo. 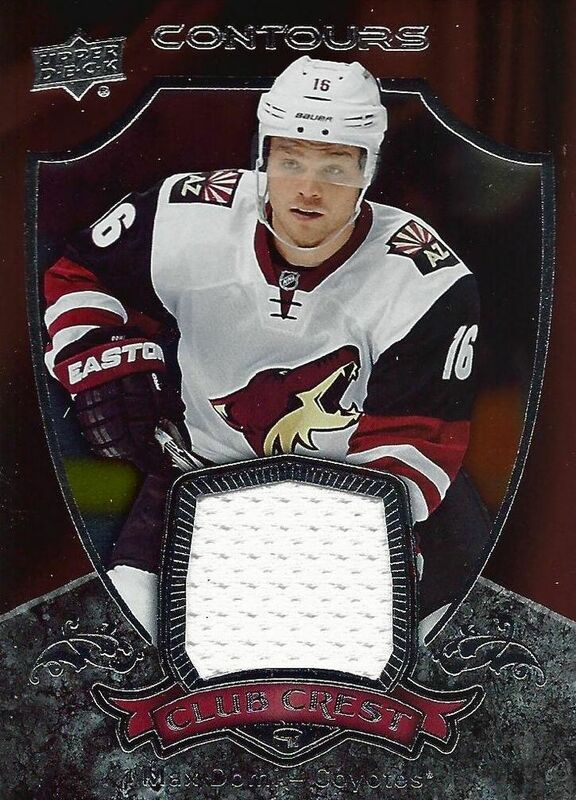 The second type are rookie jersey autographs that feature a large jersey swatch embedded in the card. These are numbered to 199 and have patch variations. Boxes of Contours are very small and come with just four packs. Each of the packs will come with a hit guaranteed. Beside hits there are is a rookie insert set that gives collectors more chances to get the rookies they want. Rookie Resume cards have three tiers of rarity - a standard rarity of /399, a version to /99, and also a /50 variation. These cards are nice looking, but I feel that they are redundant for the set - especially with so many other hit-based cards you can get rookies from. This foil insert set may have stood out better in Upper Deck Series Two or something like that. As it is here, they seem like filler. Can't get enough of the main set and want more? Upper Deck fulfills your desire by having different parallel levels of Contours. Blue foil cards are numbered to /499. Other colors are more rare with the opportunity to find autographed gold cards and printing plates. Enjoy a large chunk of material? Jumbo fabric cards are available. 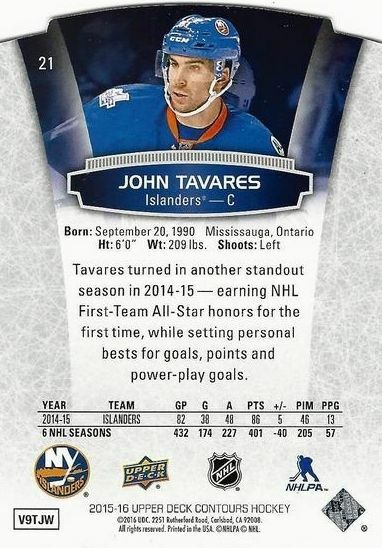 I understand why these huge swatches of 'just-jersey' are here... because a much better patch version is also available... but these cards are just too plain looking, and the jersey pieces is just a huge void of nothingness on the card. These huge jersey pieces don't look good, and I'd prefer that companies only release the patch variations. This big piece of jersey is just wasting space on the card. 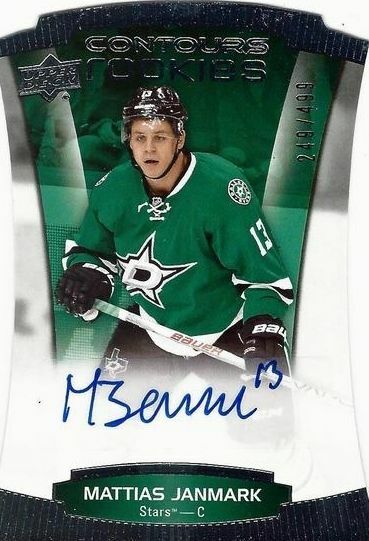 At first I thought that the Youth Movement cards were more rookie autograph sticker dumps, but they are not. They are more honorable than that. These cards feature guys that have played for a few years but that are still young. Sure, you can get rookie autos here too, but the majority of cards here are of players that have a few years under their belt. That makes this set more compelling and relevant to me. 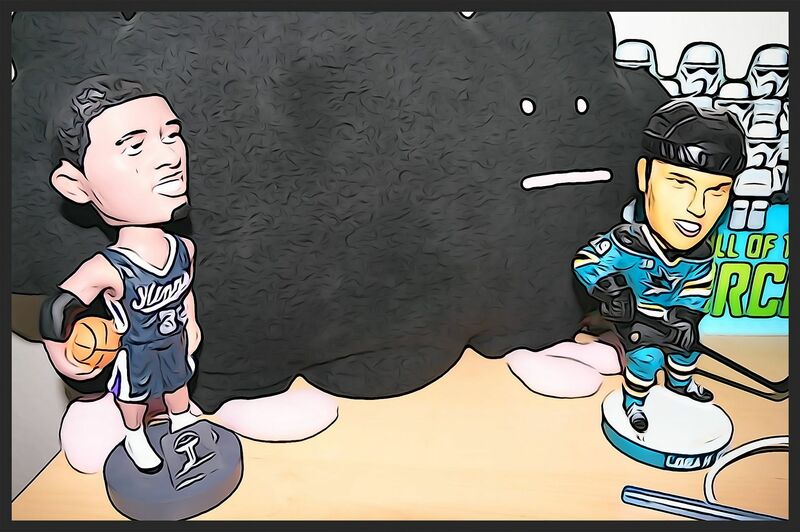 Besides the standard hockey hits, Countours offers one thing that is pretty different in terms of what collectors can find, and that's celebrity autographs and memorabilia pieces. 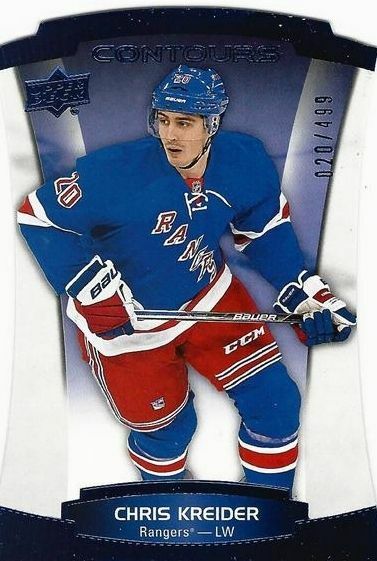 You'll find celebrity cards that are fans of NHL teams. I like this idea as it does offer something different than the norm. Sure, it's been done before, but it's still a fun thing to put in a set. Now if only there were fans of the Sharks. Four hits, one hundred dollars. If you take a look at the hits I got... you'll see the pain there! Each hit breaks down to be a whopping $25. And of course there would be no way the cards I got would ever be worth that kind of money. So in order to break even at all you'd have to pull McDavid or some big card like that. Sure, you never really come in even with hockey cards, but I'm 100% sure that collectors will find this product lacking when it comes to value. In terms of the set and its overall aesthetic appeal, it's just middling to me. As I stated in the review, I just don't see the reason for the name Contours. My prediction is that this set is not going to be a mainstay of the Upper Deck line up of brands. Upper Deck is lucky this year that there is a superstar rookie in McDavid that is drawing everyone's attention to products. 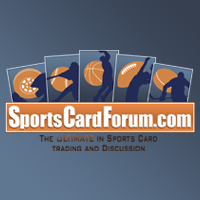 They are going to have to step up their product game next year for sure and start making products that people want, and not just rely on the crop of rookie cards that come out. So is Contours worth it? If you're curious, I'd just pick up a box for fun if you have money burning a hole in your pocket. Otherwise, I'd skip this one! Great video as always Blacksheep. Contours seems like an overrated brand and wont exist next year because it wont be successful. Nice hits but I think the box is overpriced. If i had money to spare i would buy this box. Great review, but very overpriced. I think upper deck has too much power and is sucking money out of our wallets. Not that crazy about this series. Like you said unless you get a McDavid Larkin or eichel I don't think it's worth it.. But hey, that's the hobby of collecting. Never know what you're going to get! This product isn't that bad for a UD ripoff of crown royale. Definitely loving all the coyotes in your box! I feel like this was really over hyped and a really high price at that, but some of the cards look nice. pretty cool cards! keep the videos coming! Nice review! The box may be a bit expensive for only four packs but the cards look great. Congrats for your 200 retail review! Terrible. Probably the worst set of year and that's saying a lot since UD has a lot of contenders for that title this year. Too many single color jerseys and they are all event used for rookies so they should all be "sick" patches. Overproduced going by the numbering. It is so bad....group breaks can't fill Contours on Day 1 and these guys will fill anything. Great review! I want to get this box but it seems pretty pricey considering the hits that you can get and how many. But overall nice review as always. Great review as always, Luke! Thanks for sharing your thoughts on this product. However, the same can't quite be said about the product. As you have alluded to it, UD is definitely taking advantage of the McDavid hype and any product featuring a shot of his event/photoshoot/game-worn gear (and potentially his auto) will unfortunately command a premium... which can't be outset THAT much with lower end hits à la your box. Nice review and I feel this product is fun to open, but is too overpriced for many people to enjoy/buy it. This set is also a big no no if you are a Sabres fan. I might be repeating myself, but every damn product that upper deck releases is overpriced. How can a box cos over 100$ when all you hit is plain, one color jersey cards. Still can't understand why panini left :( Nice break though, always nice to read your thoughts about new products! Great review as always! Maybe Upper Deck Contours has a little bit of a steep price but still looks like a fun break! The base cards look nice. I love the Domi jersey card and Jets rookie resume cards! 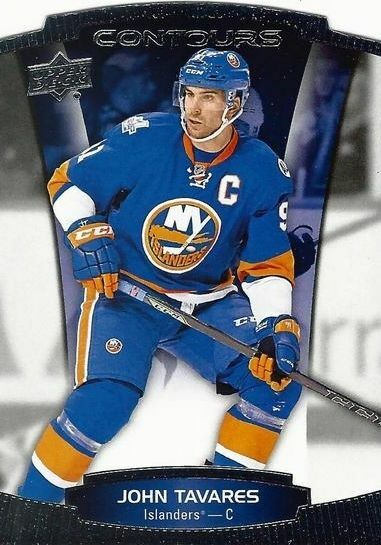 As much as i think this product looks really awesome (jersey card looked very good), it just doesn't feel like it should be a $100 per box/ $25 per pack price range. Although they do give you a rookie or insert with a hit per pack to try to make it worth the price, I still don't think it's worth it. Hi I think you made a really good review on the product like your others review and I like that your are honnest in your video. I think that those cards look very nice but it's a litle bit expensive. great review! 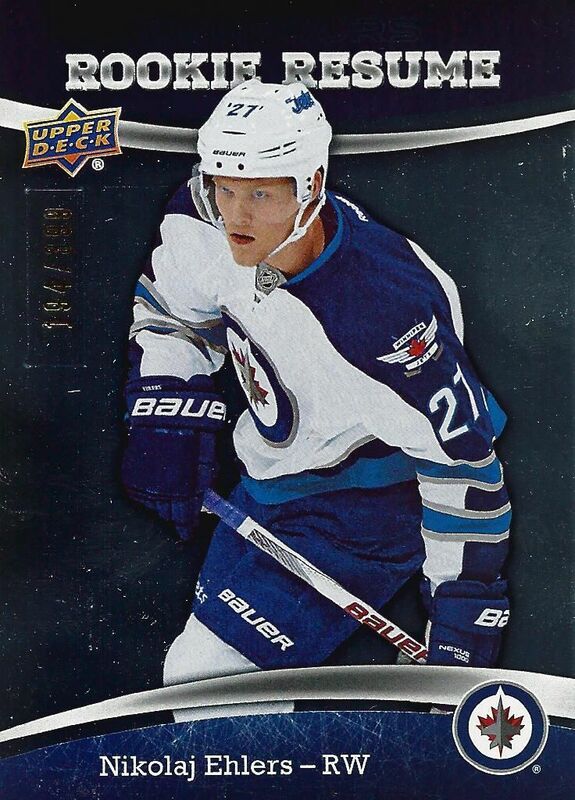 Nice Ehlers, and good cards! I think for $100 this is a bad product. It's a good product but price should be reduced. Cool break, but I don't think (for me at least) it would be worth the money, it seems very hit or miss. $25 per hit is not a bad deal! You were lucky with your box. My LCS opened a case and they didn't get much. I don't think this product will be back next year. 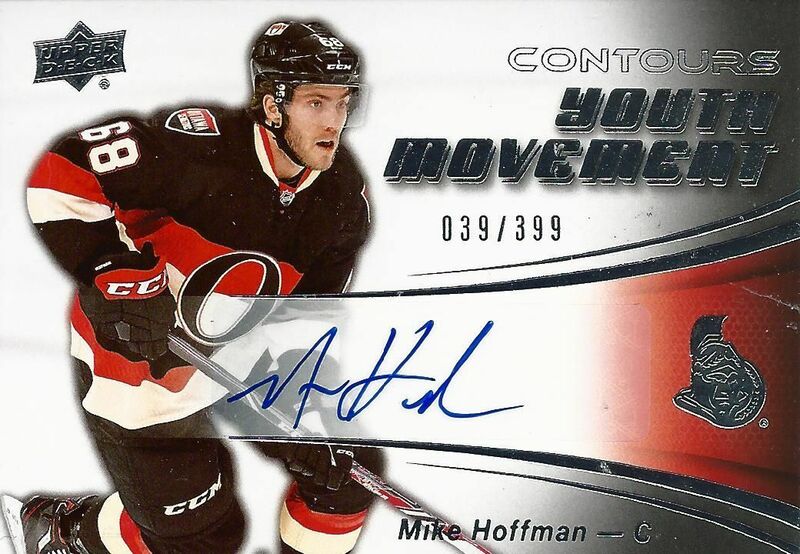 Honestly not a big fan of the dye cut cards but that Hoffman (especially) and domi were some pretty nice cards there. Nothing to different but still kinda unique. Thanks for a nice review. I think it is very helpful for a newbie player. The Youth Movement insert is a nice concept. Actual veterans but not just superstars. Nice way to get other players autos. The main 10 golf swing tips can enhance your diversion. Visit HowStuffWorks to locate the main 10 golf swing tips. The information from the original articles are helpful and nice, thank Posts. You may also check mandira bedi & chantel jeffries Biography.